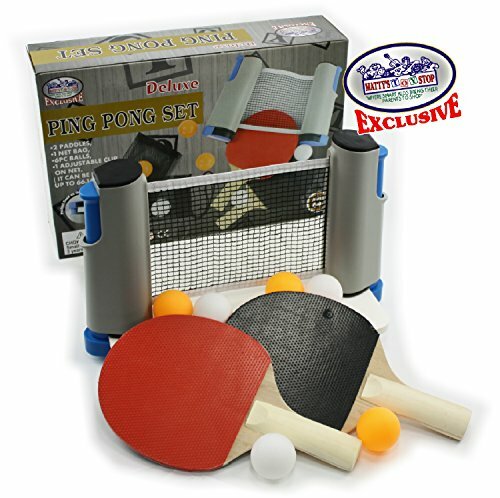 Matty's Toy Stop Deluxe Table Tennis (Ping Pong) To Go with Fully Adjustable Net, 2 Paddles, 6 Balls (3 Orange & 3 White) & Mesh Storage Bag is AWESOME! Deluxe set comes with everything you need to play, and then some! No room in your home for a big and bulky table tennis table but love the game...this is the ideal solution for you! Fully adjustable net works on tabletops or any surface up to 66 inches wide & 1.75 inches thick. The net is expandable and retractable, allowing amazing versatility. Makes a great gift and is perfect for schools, home, travel, the office or anywhere else! For Ages 6 and up - Fun for the whole family! - Great for travel! Play an exciting game of table tennis anywhere with Matty's Toy Stop Deluxe Table Tennis (Ping Pong) To Go with Fully Adjustable Net, 2 Paddles, 6 Balls (3 Orange & 3 White) & Mesh Storage Bag! Deluxe set comes with everything you need to play, and then some! No room in your home for a big and bulky table tennis table but love the game...this is the ideal solution for you! Fully adjustable net works on tabletops or any surface up to 66 inches wide & 1.75 inches thick. The net is expandable and retractable. Makes a great gift and is perfect for schools, home, travel, the office or anywhere else! For Ages 6 and up - Fun for the whole family! - Great for travel! View More In Tabletop Table Tennis.